The rugged rocks of Bird Island in Newfoundland, Canada is where this colony of Atlantic Puffin reside during the breeding season. The males will clear out the area where they will make their nest which they sometimes blanket with grass, feathers or seaweed to make the nest comfortable. This group of Atlantic Puffins take some time out from their busy schedule and congregate on top of the rocks at Bird Island. 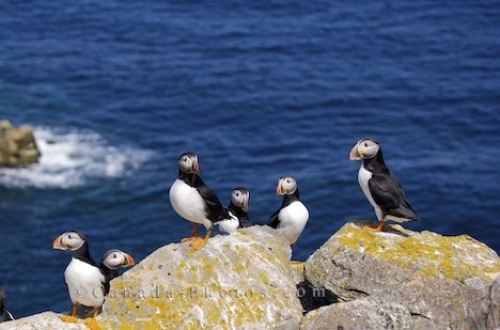 Picture of a few of the Atlantic Puffin who belong to the colony at Bird Island around Bonavista Peninsula in Newfoundland.